Experience SUP Paddle Boarding in one of the best locations in the world! Get fit while having a tonne of fun! Stop for a picnic, take a break or paddle the entire time - the choice is yours! If you have the skills combined with a sense of adventure why not choose a self-guided trip and take out our freedom rentals. Follow the shores of Lake Wakatipu around to one of the many secluded bays. Here you can stop off for a picnic or soak in the beauty that put Queenstown on the map! Paddle Queenstown will recommend a route for your trip based on abilities and the weather on any given day. It’s important to follow these instructions for your own safety. Whilst SUP'ing doesn't always mean you’re going to get wet it’s advisable to bring a change of clothes, just in case you decide to take a dip....! This is one of the best locations for stand up paddle boarding in the world! Departs: On demand between 9am - 6pm daily. Please Note: If you weigh more than 100kg, please make a note of this in the Special Requirements/Info box when booking. Freedom Hire requires a minimum of 2 people for a trip to go ahead. Maximum Height 195cm. Maximum Weight 120kg. You must carry a working cell phone. Operates daily subject to weather. Child age is 8-14 years. All children must travel with an Adult. Under 8's are not able to travel. Fun activity in a beautiful location! I tried paddle boarding here for the first time ever. The staff were encouraging and gave clear instructions which reassured me. They also took a pic of me which was nice (even though I didn’t manage to stand up! Haha!). The session was for 1 hour, which is great value, but after 30 mins my thighs were dead after balancing on my knees, so I called it a day. Fab experience though and the staff were great! Fantastic and relaxing way to see Queenstown from the water. If you have a waterproof camera this is a great way to capture some perfect snaps! We had to wait for the boards a bit and din't use that 1 hour completely but it was ok! I really liked it. We were only four people and after a short instruction, we could go on our own. It is not that difficult to do and it`s really fun. It`s relaxing and you have a great view. Two hours are a long time, we didn`t need to hurry. I would totally do it again. 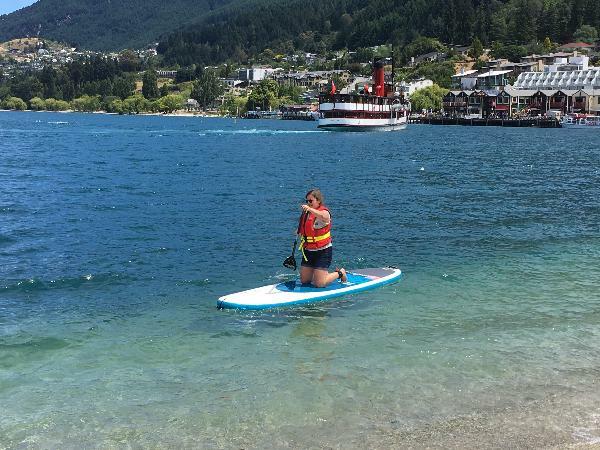 Your message has been sent to Paddle Queenstown - 2 Hour SUP Adventure. You should hear from them shortly. Please note: all responses will come directly from Paddle Queenstown - 2 Hour SUP Adventure, and not the team at Bookme.